Are you a professional organization that is looking to building a retirement plan for your players and employees? Are you a professional player or streamer who has recently found an increase in your annual income and looking to shelter it from taxes? We have the answers. Whether is is a retirement account, a corporate 401(k), or a trust/individual account, we have the expertise to tailor and manage your portfolio to your goals and objectives. Our fee-only and non-product focused approach allows us to keep the client at the center of the decision making process and keep their interests first. Being an independent investment advisor allows us to freely choose from the universe of investment options and prioritize what is right for you, the client. We specialize in creating low cost, tax efficient, and broadly diversified portfolios that are responsive to today’s rapidly changing investment environment. Establishing a financial plan will keep you confident and on track towards your goals. Our comprehensive financial planning software pulls data in real time to keep you updated on a daily basis to your financial standing. Bank accounts, credit cards, retirement accounts, mortgages, everything in one place. 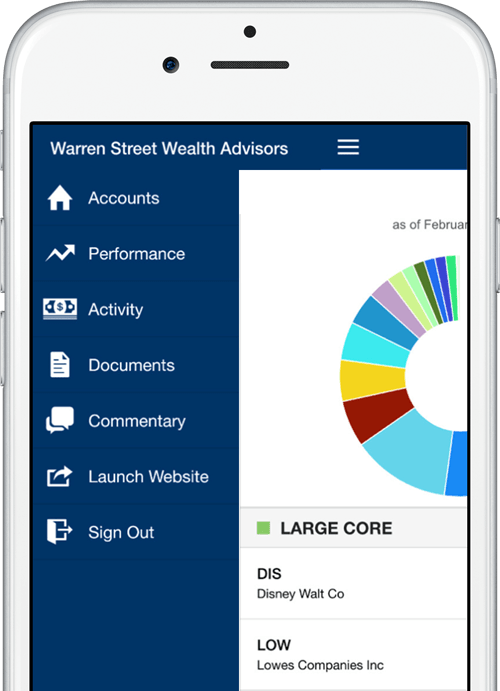 You will know your exact net worth and whether you’re on track with your plan 24/7, 365 just by checking the Warren Street App.